Health Reform and Preventive Care? I have been following the health care debate for the last few weeks. As I type this, I am watching White House press secretary Robert Gibbs defend President Obama's position on the public plan. For all the riots breaking out at health care town halls around the country, arguing about everything from death panels to socialism, when do we begin to have a discussion on preventive care and wellness? Before we can truthfully have a real discussion about health reform in this country, we need to look at what's causes most health problems. The truth of the matter here is that most of these problems are related to lifestyle choices, namely cigarette smoking and obesity. A recent survey from Health Affairs shows that $147 billion is spent annually on obesity-related problems, such as diabetes, heart disease, stroke, hypertension and certain cancers. If nobody in the U.S. were obese, we'd spend 9% less on health care. But more than a third of us are obese -- and another third of us are overweight. That's a scary statistic. Here's a scarier one: 17% of U.S. children and teens are so overweight they're in the top 5% of body size for their age on growth charts. A less nice way to put it: these kids already are obese. The health-related costs of obesity are rising. That's because more and more people are becoming obese, Finkelstein and colleagues calculate. We have to have more discussions about making healthier food options available to everyone, which includes reexamining the persistent problem of "food deserts" and overhauling how Big Food has destroyed the food system (I will write about high fructose corn syrup later). Also, regular exercise is important. Think about it: at the end of the day, a gym membership can be cheaper than a hospital bill. John Mackey, I ain't mad at you. Recent scientific and medical evidence shows that a diet consisting of foods that are plant-based, nutrient dense and low-fat will help prevent and often reverse most degenerative diseases that kill us and are expensive to treat. We should be able to live largely disease-free lives until we are well into our 90s and even past 100 years of age. Health-care reform is very important. Whatever reforms are enacted it is essential that they be financially responsible, and that we have the freedom to choose doctors and the health-care services that best suit our own unique set of lifestyle choices. We are all responsible for our own lives and our own health. We should take that responsibility very seriously and use our freedom to make wise lifestyle choices that will protect our health. Doing so will enrich our lives and will help create a vibrant and sustainable American society. Check out this video I found on preventive care. Relations between Americans and the British have not always been the greatest. From the American Revolutionary War to the disagreement over the military campaign in Iraq, sometimes it might have seem like a good idea by Mother Nature that the Atlantic Ocean separates the two warring factions. The latest battle has been taking place online. Currently, Americans are debating the future of its health care system. President Barack Obama has stated that he would like all Americans to have access to quality health care within the next decade. However, not only are Americans fighting each other over this issue in town hall meetings, Republican politicians have also accused Obama's plan to be a reflection of the UK's National Health Service (NHS), which has been viewed by some as being "socialist" at best and similar to a "death panel" at worst. Of course, the Brits are not taking this laying down. jetersfan: #welovethenhs NOT IF UR DEALING W/ A TERMINAL DISEASE AND NEVER SEE THE SAME DOCTOR TWICE!!! girlonasoapbox: #welovethenhs I wouldn't be typing this if it wasn't for free prescriptions and good care I have received from the NHS. Leave off you prats. Pro-NHS campaigners are also adding "Twibbons" to their avatars to show their support. Last night, even British Prime Minister Gordon Brown and his Sarah got into the debate with his own tweets. The White House has put out generic rebuttals on their Twitter account about the attacks. U.S. Congress is expected to vote on health reform in the next few weeks, and many analysts say that Obama's plan might have an uphill battle to face, despite having a Democratic majority in both the House and Senate. Nonetheless, this Twitter face-off might be the first of many examples where people with disagreeing views might engage each other in civil debate. 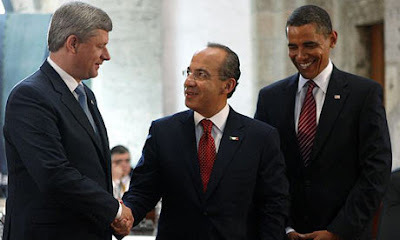 Forget the Real Housewives of Atlanta - the real drama is going down this week south of the border, where President Obama is meeting with Mexico's Felipe Calderon and Canadian Stephen Harper. NAFTA was such a great idea that I thought I would give a wrap up of what's really going on. ...Hit hard by low prices for their crops, many Mexican farm families have been forced to relocate to large cities or find work at border-town maquiladoras (factories using low-cost labour to make cheap goods for export to the U.S. and elsewhere), the NFU said. Forced off the land into major urban areas, Mexico's farmers find these cities to be "increasingly lawless and dangerous" due to rising organized crime spurred by poverty and desperation, the NFU said. "Many Mexicans are now trying to escape. Some are coming here. We need to connect the dots. Many of the Mexicans coming to Canada are refugees from NAFTA," the NFU's Saskatoon-based international co-ordinator Martha Robbins said in the group's release. Leave it up to lobbyists to spread the wealth of NAFTA to the rest of the world. Reuters reported on Wednesday that the leaders of six major U.S. business groups have called for President Barack Obama to back speedy passage of NAFTA-style “free trade” agreements (FTAs) with Colombia, Panama and South Korea. Wisely, the president has yet to send Congress any of the bilateral trade deals negotiated by former president George W. Bush with the three nations. In addition to pressing for passage of the three pending trade agreements, the groups urged Obama to pursue “major market-opening agreements with the Asia-Pacific and beyond,” essentially advocating for even more NAFTA-style FTAs. Oh, yeah, no love between Colombia and Venezuela these days either. Venezuelan President Hugo Chavez has accused Colombia of carrying out a military incursion into Venezuela. Mr Chavez said Colombian soldiers had recently been seen crossing the Orinoco river, which forms part of the border, and entering Venezuelan territory. He said the incursion - which Colombia denies happened - was a "provocation". South American leaders are gathering in Ecuador for a summit which is set to discuss Colombia's planned accord to allow the US use of its military bases. Mr Chavez has been embroiled in a diplomatic row with his Colombian counterpart, Alvaro Uribe, since news of the plan emerged. "The threat against us is growing," he said. "I call on the people and the armed forces - let's go, ready for combat!" Because it is so hot out today, I just need some chill music. I was in New York last month for the Harlem Book Fair, and had some time to do some sightseeing.